Sewing Like Mad: Sewing the Trends 2013. I love the idea for this series that Justine from Sew Country Chick kindly has invited me to participate in. 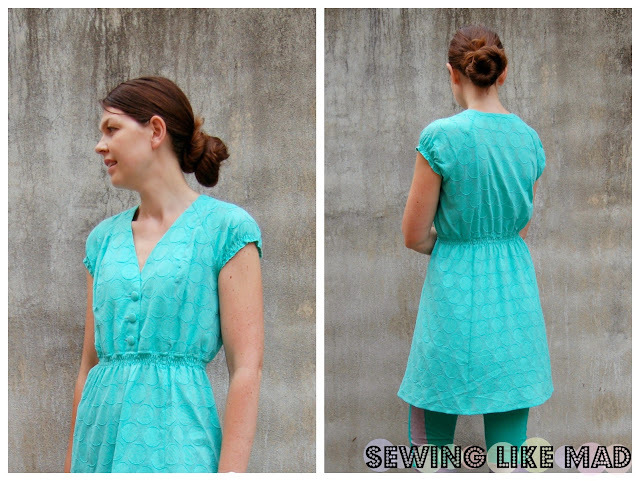 Sew something for yourself showing one or more of the summer trends 2013. One thing is loving the concept another thing is actually knowing what the summer trends 2013 are....I had no clue. In my opinion there are two types of trend groups every season - the trends on the runway - as in what did the high fashion designers make for their spring/summer collections 2013 (check out THIS Pinterest board Justine has started) and then there are the trends of what normal people with some fashion interest wear in daily life. Those two trend groups are of course connected but usually the greater population are a few seasons after the designers. And what I am trying to say is that I am not really following what the designers put on the runways anymore (okay, I check my favorites like Marc Jacobs, Marni and Celine but that's about it)....hence the 'no clue' to the summer trends 2013. That does not mean I am not interested in it and in this post I am showing you my version of an outfit that unites the two trend groups. I took a look at the previous mentioned Pinterest board and of course the graphic trend was calling on me. And to integrate that trend into what people are actually wearing right now I focused on colors that I would say is pretty hot right now the mint/aqua/pastels/metallic. The dress I would say is a fairly classic/timeless cut. And what makes me say that? Well, it is actually a dress from my spring/summer 2007 collection back when I had my women apparel company in Denmark, and in my humble opinion I don't think it looks particular outdated. The dress has raglan sleeves, covered buttons at the front and a few rows of shirring in the high waist/low empire cut and the sleeves. Simple and extremely wearable. There is no tutorial for this post but I wanted to show you the pattern pieces for this self-drafted pattern. I am not quite sure why but I decided to skip the side seams - it's been a while since I made it as you know - but skipped they are. And that gives a funny looking side, front and back top piece as you can see but it totally works, promise. 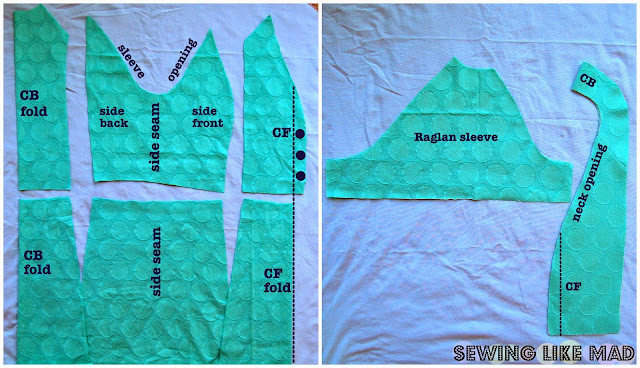 The dress pattern pieces are put next to each other the way they are sewed together. No room on the left photo for the raglan sleeve and neck facing which you can see on the separate photo on the right. The dress is made with what I think it my favorite buy from Fabric Weekend, LA. This beautiful mint/aqua thin cotton (almost voile type) fabric with those great big polka dots that almost looks like they are glued on top with tiny raw edges all the way around them. I bought it at Mood and that shop is AMAZING - I could have spend days (and fortunes) in there. Don't miss the opportunity if you come by their NY or LA shop.....or check their webshop. Of course I bought it without having a specific idea of what to make with it so when I decided to make this dress I did not have quite enough fabric sooooo I decided to shorten it a bit. What you see above are images from my spring/summer 2007 look book and as you can see did I offer it as a top and a knee length dress. For this post I guess I ended up doing a middle version of those two. Seeing the photos of myself I kind of wished I have had enough fabric to make it knee length because...well, you don't exactly think of sticks when you see my thighs but it is okay(-ish), sigh! And then we have those leggings. It all started with Pinterest (of course). I saw a photo of the ever so cool Jenna Lyons wearing a pair of Celine pants. And first I made a pair of corduroy pants for Wilma. You can see the original Celine pants and my knock off HERE. Then I made a skirt HERE and then I made the kids leggings HERE. Phew, and now I made the adult version leggings too, wohoo. 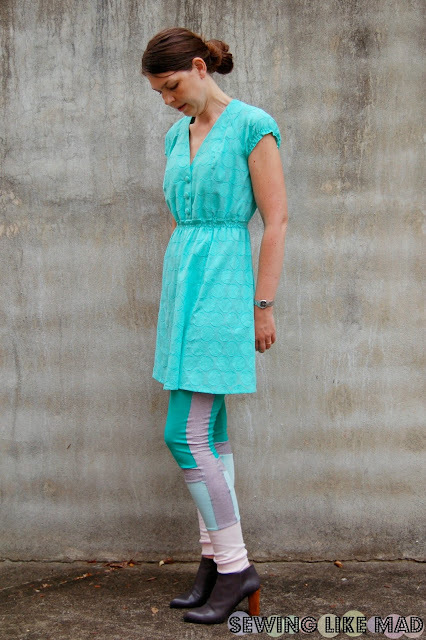 I wear leggings and dresses all the time but have never made a leggings pattern for myself before - ridiculous because that is actually quite easy! I am SO going to make a lot more of them. I mean the color combinations are endless, right! I love how the four fabrics in the leggings totally represent Fabric Weekend, LA. It is totally random that it ended like that - I DID choose what I thought looked best with the dress and together of course. Two fabrics from friday's shopping in LA's fabric district with Michael Levine as the biggest attraction and ehhh the other fabric is bought in one of the many small fabric stores that are around there. Then two fabrics from saturday where we first went to Mood and then some of us to SAS - a shop I would never even come near if I passed it alone (pretty sure I would not even go to that neighborhood alone) but I found some really really great things in there. Like narrow striped piping for 15 cent/yard (WHAT??? YES!!). So here you have it, my version of Sewing the Trends 2013. Don't forget to check out the other amazing ladies in this series. There will be links to them all on Sew Country Chick. Thank you Justine for having me. Love those leggings! You totally wear those just as pants. I've been inspired! I love the teal and grey combo too. This was my first visit to your blog and I'm your newest follower on FB, Pinterest and Bloglovin! Can't wait to see what you come up with next! 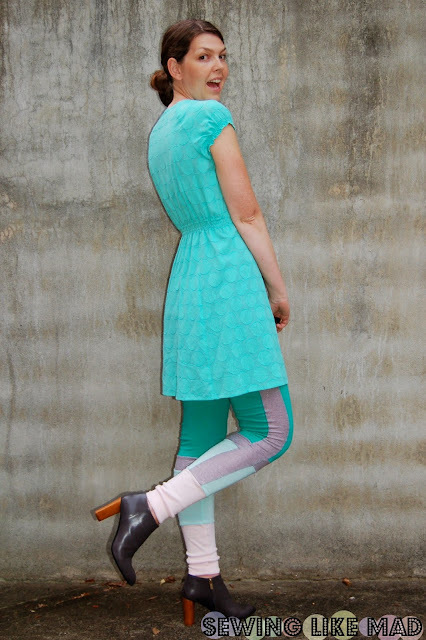 Beautiful colors and I love the leggings! Saw your post on Gingerly Made. in the cute dresses you make her.. Happy sewing. Those leggings are AWESOME!!! Now I want to make some. Love them. Cool outfit! That fabric is great! Those leggings are so cute, Mie! Cute outfit! I really like those leggings! 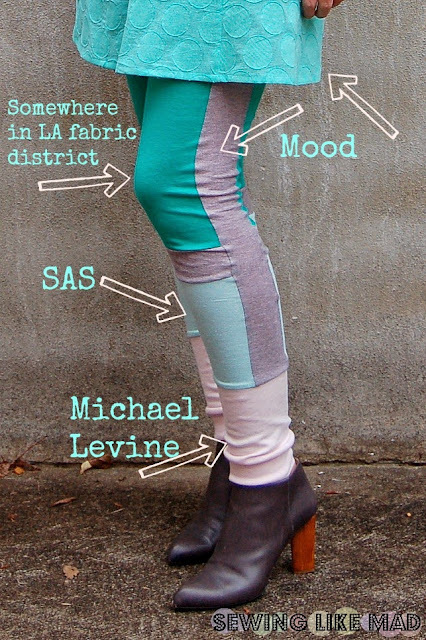 Any chance you might do a tutorial on making leggings? I love the pair you made.